I see Matt Abbott tackled him too. 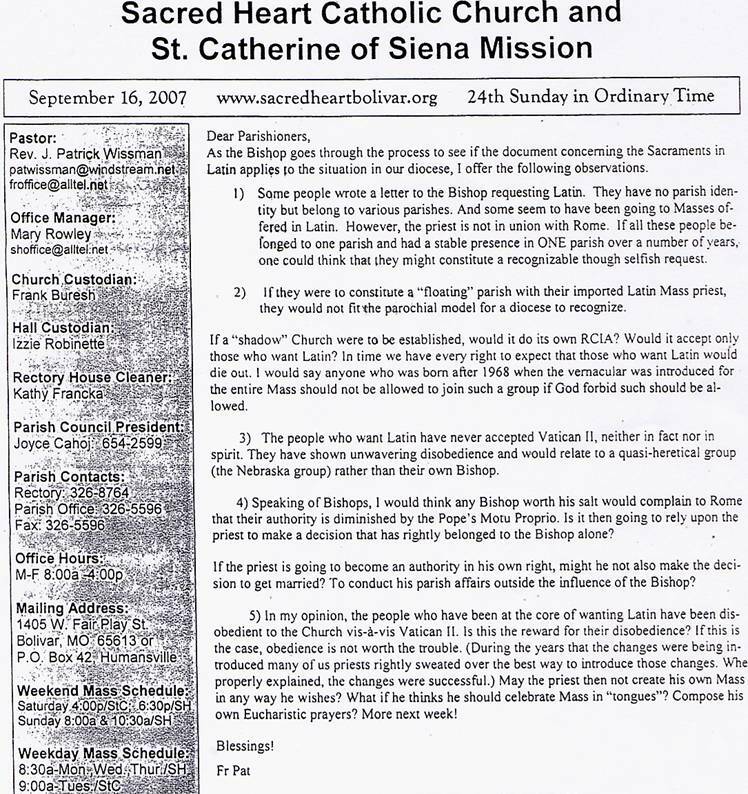 Here is a 16 September blurb in the parish bulletin of Sacred Heart Catholic Church and St. Catherine of Siena Mission in Bolivar, Missouri where Fr. James Patrick Wissman is pastor. He is just "Fr. Pat", there. I picked it up from the website of The Remnant. It is available only in scanned form on that page, so here it is transcribed. This is undoubtedly one of the stupidest things I have ever read from the pen of a priest. In the wake of Summorum Pontificum we can really see with these extreme examples, how the sides are divided. My emphases. I don’t think this needs much interlinear comment, and prudence restrains me. The errors and ignorance speak for themselves. As the Bishop goes through the process to see if the document concerning the Sacraments in Latin applies to the situation in our diocese, I offer the following observations. 1) Some people wrote a letter to the Bishop requesting Latin. They have no parish identity but belong to various parishes. And some seem to have been going to Masses offered in Latin. However, the priest is not in union with Rome. If all these people belonged to one parish and had a stable present in ONE parish over a number of years, one could think that they might constitute a recognizable though selfish request. 2) If they were to constitute a "floating" parish with the imported Latin Mass priest, they would not fit the parochial model for a diocese to recognize. If a "shadow" Church were to be established, would it do its own RCIA? Would it accept only those who want Latin? In time we have every right to expect that those who want Latin would die out. I would say anyone who was born after 1968 when the vernacular was introduced for the entire Mass should not be allowed to join such a group of God forbid such should be allowed. 3) The people who want Latin have never accepted Vatican II, neither in fact nor in spirit. They have shown unwavering disobedience and would relate to a quasi-heretical group (the Nebraksa group) rather than there own Bishop. 4) Speaking of Bishops, I would think any Bishop worth his salt would complain to Rome that their authority is diminished by the Pope’s Motu Proprio. Is it then going to rely upon the priest to make a decision that has rightly belonged to the Bishop alone? 5) In my opinion, the people who have been at the core of wanting Latin have been disobedient to the Church vis-a-vis Vatican II. Is this the reward for their disobedience? If this is the case, obedience is not worth the trouble. (During the years that the changes were being introduced many of us priests rightly sweated over the best way to introduce those changes. Whe [sic] properly explained, the changes were successful.) May the priest then not create his own Mass in any way he wishes? What if he thinks he should celebrated Mass in "tongues"? Compose his own Eucharistic prayers? More next week! For obvious reasons, I won’t open the combox. However, if you send me your intelligent comments by e-mail, I will add them here. 6) The Pope seems to be out of touch with the ordinary church. He seems to be acting in good will, but giving into the "letter writers" who have been complained for years, he will create a shadow church and cause great divisions in every diocese. Such will be that when churches are built, they would have to accommodate both rites and seminarians would have to take courses in Latin. During many centuries seminarians have fallen through the cracks and not been able to reach the goal of the priesthood because Latin was too difficult for them. This was a scandal! To return to such a course would be lunacy! 7) The nature of the language we worship in is crucial. Worship language must be immediate… namely, not translated in the head – Latin would speak to the intellect at bestand [sic] that is not good enough. The language of worship must speak to the heart as well as the head. 8) The gospel is meant to enlighten and challenge us! It is my opinion that the use of Latin should have been done away with hundreds of years ago. This is one of the things that Martin Luther was right about. After WWII Christians worldwide shook their heads in sober sadness and declared that Christianity had failed in Europe because it has let Hitler and his hateful and mad ways to succeed. Some very holy people said: "No, Christianity was just never tried." I fault the use the Latin as partly responsible for the rise and success of Hitler and his neo-pagan mythology which was obviously the religion he was supporting and that actually managed to capture the German imagination.. [sic] I say the people, because of Latin never confronted by the gospel. The Mass and the sacraments never really reached deep into the soul. There are some notable exceptions of priests and laity and some very heroic ones as well as Protestant theologians who confronted the lies of Hitler – of course, they were gotten rid of. 9) As soon as the Romance languages attained literary status they should have become the language of worship and sacrament. 10) Saint Paul says that it is better to pray to God with ten words we understand than to pray with thousands of words we don’t understand. He says, too, that some people want their ears to be caressed by all they hear, that they are itching for what pleases them. They are being misled by the power of evil. Did you get that whole thing about Latin, Hitler and evil? Continuing with reflections on the Motu Proprio on the use of Latin. 11. I fear that one of the reasons the church has done so poorly in Europe is because the renewal of the Liturgy never took place. It did here, though! It has been one of the reasons that the American Church has thrived and even now grows greatly by new members joining from other Christian churches. When exposed to the liturgy and sacraments of the Church, they are overjoyed at the theology, the content and faith they portray and feel they have found their true home. Latin would make even the Holy Spirit stumble. 12. Latin is not a "sacred" language (as would be Hebrew or Greek (and Aramaic), the languages the bible was originally written in. But even they would be a hindrance to true worship and sacrament. Can it be that the people who want Latin really don’t want to be challenged by the gospel and be called to be thoughtful of others and be willing to sacrifice an external like Latin for the sake of the whole? 13. The choice to do a Latin Mass or sacraments according to the Pope’s document would rest with the priest, not with the people and not with the Bishop. 14. There is an insinuation in the Motu Proprio and certainly with the people who want Latin, that the changes of Vatican II were unnecessary, that the liturgy was in a good state and returning to some of the ancient practices of a better time were wrong. They would suggest there was no need for a renewal or an awakening of the faithful to the liturgy of Mass and sacraments. This attitude is unacceptable. The liturgy was in deplorable state, not only the language was unintelligible but the accretions of meaningless practices and legalistic attitudes of rubricism were a hindrance to meaningful celebration. In those days Catholic spirituality was in a bad state. Holy Communion was rarely taken by the faithful (a law had to be made to force them to take communion at least once a year) and Mass was viewed as something magical and superstitious. The true understanding of the theology of Mass and sacrament was rare. 15. The Gregorian chant although beautiful when sung correctly was almost never done with skill and beauty outside monasteries. Singing in the Catholic world of the United States was a poor at best and monotonous – with a few hymns making up the entire parish repertory, the exception being at Christmas where there were plenty of English language songs to be sung. 16. The unity of our rite or worship would be seriously jeopardized. If we are going to develop a variety of rites that a catechumen or candidate would choose from, we would confront them with confusion. We can perhaps reflect on the wonderful gifts from God that we call Sacraments! Folks, if you think I don’t hold you readers in high regard, think of what it cost me to type that out. In these words, however, we have a window into the mind of a true aging-hippy, one of the priests whom I describe as "one change priests" (they had one change in them, they spent it, and they are now the most rigid and inflexible priests you can imagine). This is truly instructive. Finding a remedy for this will not be easy. We must parse their words with clarity and drag them out into the sunlight. They must not go unchallenged. However, for this sort of extremist, who will never be convinced by arguments I doubt he could understand, we must fast, pray and given alms. And I do mean that literally. We must be very careful in how we deal with fellows like this… and those whom he has influenced. May I suggest saying a prayer for the illumination of Fr. Pat and for the consolation of those poor people whom he has so terribly abused with his comments? You have no idea how pleased I was to read this article. You see, we live near Bolivar, and because of similar statements made over a year ago, we went to another church, and stopped going there, THANK GOD! Previously Father Pat took my son aside, and explained to him that he wasn’t allowed to kneel for communion. He did this while I was in the church praying, when I came out, I caught the last of the conversation, and being me jumped right in with both feet. I was informed that the Bishop can override the authority of the Pope (whom I had mentioned encouraged this practice) in his own Diocese. How do you argue with that? Well, I didn’t, being a fiery sort, I decided that it would be best to just leave before I did or said something I regretted. Anyhow, we started driving 3 hours (one way) to another diocese to church, because most of the parishes except for just one or two that I have attended (there may be more, but I don’t know of any) they almost all spout this sort of talk. Lucky for us, we went to a nearby church with much reservation, because the 6 hour car ride is difficult with 4 children. We were rather guarded, but happened upon a new parish that had a new priest, it was his first day. We watched, we waited to see what would happen. After it was apparent that his liturgy was pure and in perfect union with Canon law, we decided to join. personally) are not true, and we are indebted to you for casting light on our plight. What can we do, but pray, fast and do penance? You are absolutely correct, we have been doing so for over a year, and look at all the fruits from our labors. language, I see no difference between Fr. Wissman and a Sedevacantist. putting out to his parishioners? of information that benefits the Faithful. May God Love You!